Size Exclusion Chromatography (abbreviated SEC), or Gel Permeation Chromatography (abbreviated GPC), uses porous plastic beads as a stationary phase. The beads are not completely uniform, and the pores or channels may be of different sizes; there may be some really tiny ones as well as larger ones. Because the beads are porous, molecules can get caught in the pores as they travel past the beads. Figure PM11.1. 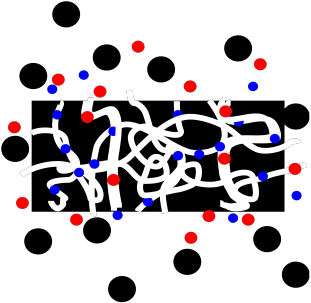 Molecules of different sizes interacting with a porous bead. Smaller molecules are more likely to get caught in these pores, because small molecules can fit into these small spaces more easily. In contrast, larger molecules can't fit into the pores, and they are more likely to keep moving past the beads. The small molecules spend most of their time in the stationary phase, and elute very slowly from the column. The large molecules spend their time in the stationary phase, and elute very quickly from the column. In between, some molecules may be able to fit into some larger pores but not the smallest ones. They will spend an intermediate time in the stationary phase. Figure PM11.2. Molecules of different sizes flow through a column packed with porous beads. In practice, SEC is a method of separation for macromolecules. 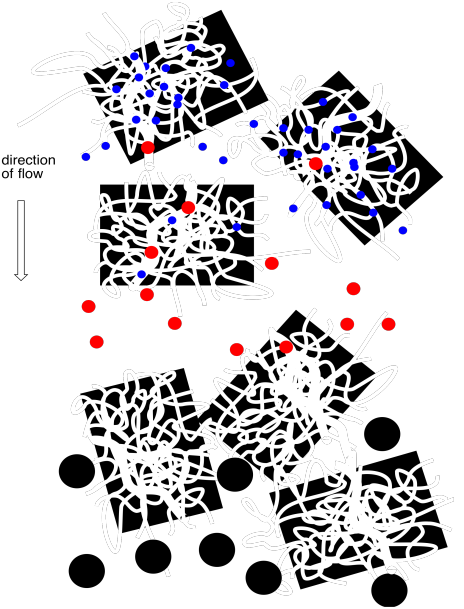 Polymers are often separated this way, and so are proteins. You need really enormous differences between the molecules to get significant separation with this method, and that isn't likely to be the case if the molecular weights are generally low. Predict the order in which the following compounds would elute from a size exclusion column.